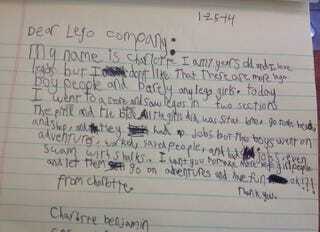 A seven-year-old girl named Charlotte has taken LEGO to task for not only making more "boy people" than "lego girls," but sending the former on adventures while the latter "sit at home." "All the girls did was sit at home, go to the beach, and shop, and they had no jobs," writes Charlotte, "but the boys went on adventures, worked, saved people, and had jobs, even swam with sharks." Her request is simple: "I want you to make more lego girl people and let them go on adventures and have fun ok!?! from Charlotte. Thank you." Call us crazy, but we think Charlotte's on to something here. After all, what good is a visit to the beach if you're not going to swim with any sharks? LEGO has been criticized before for failing to bridge the gender gap in its line of minifigs. To its credit, they've made moves in recent years to do so, but the company still has a ways to go. For an excellent overview of LEGO's production history of female minifigs, the careers they do (or don't) get to have, and the adventures they do (or don't) get to go on, see this excellent post by Maia Weinstock, which was published last year – around the same time LEGO released its first female lab-scientist minifig (pictured at left – Photo Credit: Maia Weinstock).